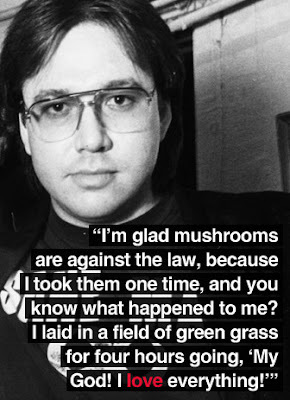 William Melvin Hicks or popularly known as Bill Hicks was an American stand-up comedian, social critic, satirist, and musician. I left in love, in laughter, and in truth, and wherever truth, love and laughter abide, I am there in spirit. I loved when Bush came out and said, "We are losing the war against drugs." You know what that implies? There's a war being fought, and the people on drugs are winning it. I don't do drugs anymore... than, say, the average touring funk band. As long as one person lives in darkness then it seems to be a responsibility to tell other people. I don't like anything in the mainstream and they don't like me. People in the United Kingdom and outside the United States share my bemusement with the United States that America doesn't share with itself. And if I can take part in it by transforming my own consciousness, then someone else's, I'm happy to do it. Children are smarter than any of us. Know how I know that? I don't know one child with a full time job and children. We are the facilitators of our own creative evolution. If you're so pro-life, do me a favour: don't lock arms and block medical clinics. If you're so pro-life, lock arms and block cemeteries. If you don't think drugs have done good things for us, then take all of your records, tapes and CD's and burn them. Life is only a dream and we are the imagination of ourselves. Listen, the next revolution is gonna be a revolution of ideas. Music is a great energizer. It's a language everybody knows. I'm a heavy smoker. I go through two lighters a day. Ultimately, it is in fun. It is supposed to be highly entertaining. Women priests. Great, great. Now there's priests of both sexes I don't listen to. I'm not really a heavy smoker any more. I only get through two lighters a day now. Your denial is beneath you, and thanks to the use of hallucinogenic drugs, I see through you.